The true value and advantage of the Eclipse line is realized when customers consider the performance, the reliability and the simplicity of maintenance required over the life of the pump. May 3, 2016 (PRWEB) May 03, 2016 -- Pulsafeeder, a global leader in fluid handling technology since 1942, today announced the Eclipse Series of Metallic Gear Pumps. With 12 different metallic and non-metallic pump models, the Eclipse family of gear pumps addresses a wide variety of chemicals, connection sizes and flow ranges for water treatment and chemical processing applications. The Eclipse family of gear pumps features a patented front pull-out design that makes routine maintenance faster and easier, with a minimum number of tools required. 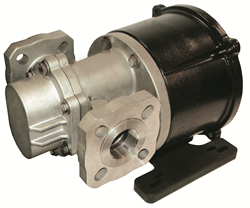 The Eclipse series features the fewest number of parts compared to any other external gear pump on the market. Pulsafeeder’s KOP (Keep-on-Pumping) kits provide all of the spare parts required to further simplify maintenance and minimize downtime. The new versions of Eclipse offer enhanced performance, and new flange options. Eclipse now offers two different types of metallic gearing - Alloy C and 316LSS - for addressing higher temperatures (up to 450-F/232-C) and wider viscosity ranges for process chemicals. Each member of the Eclipse series is magnetically driven, with no seals to wear or replace, providing the safe and leak-free handling of highly corrosive fluids in a wide range of temperatures. The complete line of Eclipse Gear Pumps includes the 02, 05, 12, 25, 75 and 125 models in metallic and non-metallic configurations. For more information on Eclipse Pumps, please visit: http://www.pulsa.com/eclipse. In the early 1940’s Pulsafeeder pioneered the hydraulically actuated diaphragm metering pump principle, and the company has been a global leader in fluid handling technology ever since. With experience in multiple industries, including: water and wastewater treatment; chemical and petrochemical processing; oil and gas refineries as well as upstream applications, Pulsafeeder’s reciprocating and rotary gear pumping technologies meet and exceed the industry requirements for safety, reliability and precise control. For more information, visit: http://www.pulsa.com.